After the great success I have had with Metal Necrozma Looker – I’m now at 20 W and 5 L overall – I decided to try out the Psychic version of this deck with Lunala Prism and Necrozma GX (BUS 63). It functions very similarly to the Metal version: hit with Necrozma’s big attack and then reload energy with the Prism card or with Oranguru’s Resource Management combining with Looker to return Max Elixirs into your hand. but I did make a change during testing. About nine games in, I changed out an Oranguru for a Spiritomb (UP 53). Having the ability to go grab a draw supporter after you get N’d to a low hand count is extremely valuable. Unfortunately, I did not have nearly as much success with this deck as I did the Metal version. I went 9 W 8 L with this deck. And maybe I did just have an unbelievably good stretch of good luck with the Metal variant, starting out 15 W 1 L as I basically went 5 W 4 L after that great start. One thing I am noticing though is that I am not using Oranguru or Looker at all in this version. I didn’t play Looker a single time and only benched Oranguru four times and not once in the last eight matches. I did play Lunala Prism in every match except for one (it was prized), but that’s to be expected. Maybe that’s part of the problem, but I seem to be relying more on Full Moon Star to get energy back on Pokemon. Part of it also might be the Metal variant had that awesome strategy of letting your opponent KO a Pokemon and then you com right back and incinerate them with Sun’s Eclipse GX and still have a fully loaded Pokemon ready to KO whatever comes up next. Part of it might be that three energy attachments only does 190 for Psychic Necrozma GX. But it might just be that the Metal version is better. Still, this is a fun archetype to play – Metal or Psychic – and I plan on spending more time on it in the future to see what other changes I might be able to make to get it to work even better. For Necrozma as a main attacker, his best partner until Forbidden Light drops will always be Metagross. Thing is, Metagross is certainly not as easy to set up as this deck, nor will it always yield you 3 Metagross on the benchline. But as someone that has played a Necrozma teched Metagross deck, if you run into things Metagross cannot OHKO, Necrozma will do the job for the deck and wreck things. 190 is a good number that shreds most basic GX’s, add a choice band and you’re at 220, and Metagross just accelerates energy smoothly. Of course, that sort of deck is at the mercy of Weavile, but what can ya do. Malamar will put in a whole lot of work for the this Necrozma, Dawn Wings Necrozma, and Ultra Necrozma several weeks from now. 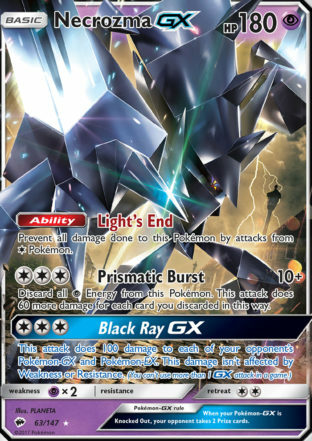 As a side note Lance Prism Star…if only Phantom Forces Hydreigon was reprinted: I would use a Hydreigon BREAK deck in a heartbeat. But Dragonite GX….Dragons finally take flight months from now. Hey Juan. Yeah that Malamar is going to be really popular. I actually tried a Psychic energy only Metagross Necrozma GX deck but only won about half of my games with it. I think that Alolan Marowak could be good too. Not sure what it means that we’re suddenly getting lots of energy accelerator options. Maybe in preparation for losing max elixir, maybe attack costs will skyrocket? I think an all Psychic energy Metagross deck was where you went wrong. Yes you want Necrozma for coverage, but Metagross is still a fine Mon in the meta because of it’s colossal Hp and it’s ability to OHKO Lele’s and whatnot (Garchomp certainly can’t survive a one shot), so for that deck, just keep it Metagross based, but do have room for Necrozma and Psychic and Metal energy: it can do just fine rather than stray away from the norm. And on the topic of Max Elixir rotating as we get multiple energy accelerators….perhaps we will see a Max Elixir successor, but slightly tamed yet universal. I can totally see something like an Elixir for all decks and stages pf pokemon, but with a catch like discarding the top two cards of your deck afterwards or something of the sorts. For the immediate future, be careful with Beast Ring: combo’ed with Tear Away Weavile and you have yourself obscene levels of energy acceleration that no other deck could match. Believe me, it’s a nasty idea on paper. Yeah the all psychic necozma metagross was just pretty much just trying to see if I could get it to work, make it viable. Beast Ring and Tear away are a good combo… It’ll still work with Magearna too post rotation right? Geez August Pokemon is going to be so crazy this year. It can work, but to a lesser extent since Magearna is once a turn for her ability. But yes August will be wild, more specifically September post rotation (seen the new Quagsire? It actually gives the Water Palkia Gx a huge boost, as well as to the other water mons out there as well)!